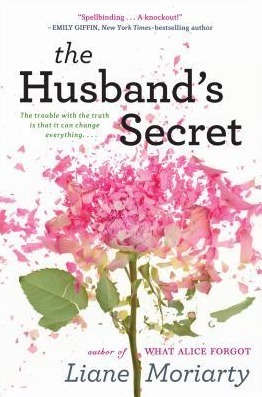 The Husband’s Secret – Ultimately, a book about the choices we make, and where they lead you. This is one of those books I think you should know as little as possible before diving in. I picked this one up and I had a completely different (wrong) idea of what it was about and how the story was going to unfold. So glad I did. The book was a nice surprise. The Husbands Secret explores the decisions we make and the resulting affect these decisions have on our lives, and those around us as well. The theme starts right at the beginning, the very first sentence. If it weren’t for the Berlin Wall, Cecilia would never have found the letter, and then she wouldn’t be sitting here, at the kitchen table, willing herself not to rip it open. The story is told from the alternating perspectives of three very different women: Cecilia, Tess, and Rachel. Told over the course of a week before Easter Sunday, Ms. Moriarty weaves the narrative around the same points in time, visiting in turn with each of the women. Her narrative is always interesting, sometimes funny, and other times heartbreaking. I listened to this one, and looked forward to hearing every sentence. This is one book that had me still thinking about it and the characters after I was finished reading. None of us ever know all the possible courses our lives could have and maybe should have taken. It’s probably just as well. Some secrets are meant to stay secret forever. Just ask Pandora. I had to check and see what else the author wrote because the name seemed familiar. I checked out her “Big Little Lies” based on my oldest daughter’s recommendation. That one had a twist but it was just hinted and teased throughout and revealed at the very end. It also had changing viewpoints. I actually couldn’t take it and about halfway through gave up and read the ending – I have no patience! Then, once I knew the ending, the story itself held no interest for me. I wonder if this one would be the same? Maybe listening instead of reading would help? I’ve heard from some that they liked this book better than Big Little Lies. This one didn’t necessarily have a huge twist, but the storyline was interesting. Cecilia reads the letter maybe halfway through the book? To me the interesting piece was how everything came together. And I liked how she flipped between the women. Many times they were all doing something totally unrelated to each other, it was just a snapshot of each woman’s life at that point in time. The narrator was great, but I’m sure I would have loved reading this one as well. I loved this book! Moriarty does such a great job of fleshing out her characters. I can’t wait to see what she’s got in store for us next! Yes, she did a great job with the characters! I will be reading more from her for sure. This one looks so good! I really liked it. And the story was not what I was expecting at all!